Moscow, February 26, Interfax – The Moscow Patriarchate welcomed the election of Metropolitan Onufry as the locum tenens of the Metropolitan Diocese in Kiev. “Metropolitan Onufry is an experienced church leader, respected by his brothers and by his flock. He is well-known in Ukraine and in Russia, where he spent 19 years at the Trinity Sergius Laura monastery,” Archpriest Nikolay Balashov, spokesman for the Synodal Department for External Church Relations, told Interfax-Religion. During his years at the monastery, Metropolitan Onufry “performed his duties, regulating the divine life of this large monastery. He visits Russia quite often for spiritual contacts with monks there,” he said. As a member of the Moscow Patriarchate’s delegations he participated successfully in inter-church talks, including with delegations of the Constantinople Patriarchate. 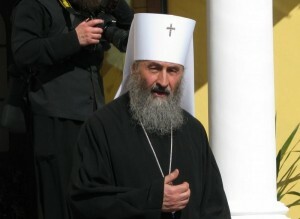 Reports said earlier that the Synod of the Ukrainian Orthodox Church of the Moscow Patriarchate has elected Metropolitan Onufry of Chernovtsy and Bukovina to be the locum tenens of the Metropolitan Diocese of Kiev given that Metropolitan Vladimir cannot perform his duties as head of the Ukrainian Orthodox Church any longer. Metropolitan Onufry is a consistent advocate of Ukraine and Russia’s spiritual unity. In November 2008, when Ukraine was marking the 75th anniversary of the Holodomor, he spoke against the Orange camp’s attempts to manipulate the issue in order to drive a wedge between Russia and Ukraine, and said in an interview with Interfax-Religion that believers should not turn the commemoration of Holodomor victims into a political action, but instead pay attention to its spiritual causes. Holodomor was punishment for people’s revolt against God, he said. In January 2009 Metropolitan Onufry was among the 14 nominees for head of the Moscow Patriarchate, proposed by the Bishops’ Council. He however failed to join the top three candidates, although he mustered as many votes as head of the Ukrainian Orthodox Church Metropolitan Vladimir.